Hanukkah starts Sunday! While many Jewish Americans, and Jewish people around the world, are excited, it can be hard on someone watching their weight or blood sugar. Hanukkah’s delicious food can make it hard to make healthy choices. As the holiday marks the miracle of one night’s worth of oil lasting eight nights, it is unsurprising that much of the food is fried. And the foods that aren’t fried are frequently quite high in starches and carbs. There are some things you can do to make any winter feast a bit healthier. Don’t over salt your food. Use healthier ingredients when possible. Don’t overindulge. But then there other healthy tips that predominantly apply to Hanukkah. The tips include: leave the deep fryer in the cupboard. Swap out the sour cream for yogurt. Use sugar-free applesauce or make it yourself. Today, we’re going to be looking at one of Hanukkah’s most iconic foods — latkes — and presenting you with healthy and delicious alternatives. Of course, every family is different but many of us associate the fried potato pancakes with the Festival of Lights. If you have other traditions or different foods you would like healthier recipes for, email us at socialmedia@neulivenhealth.com. The problem with latkes is not just that they are deep fat fried but that they are made from potatoes which have a low GI. Here are six different vegetable latkes that would be a great addition to your Hanukkah dinner with less impact on your blood sugar. Lightly pan frying these keeps them significantly lighter than they would otherwise be! 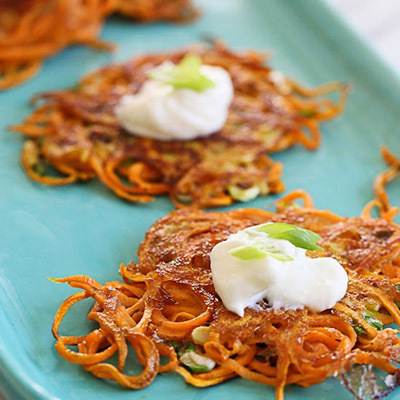 These sweet potato latkes aren’t just simple, they are pretty enough to be a decoration! Instead of grating potatoes, you use a spiralizer to save you both time and effort. With only a few ingredients, the recipe only takes 30 minutes to prepare and cook. Each serving has 125 calories and 11 grams of carbs. Get the recipe here. 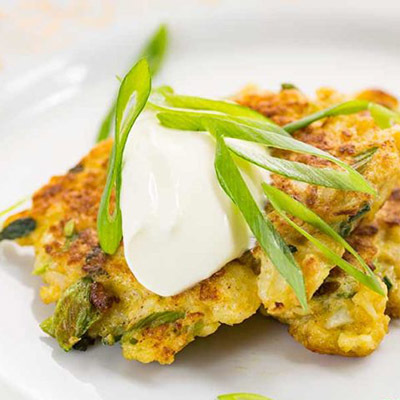 This tasty recipe for cauliflower and scallion latkes are easy and sure to be a hit with any cauliflower fan. They do require a sitting period and call for the cook to squeeze the liquid from the cauliflower. So be aware that you should allow time for the cauliflower to sit. Each serving has 225 calories and eight grams of carbs. Get the recipe here. 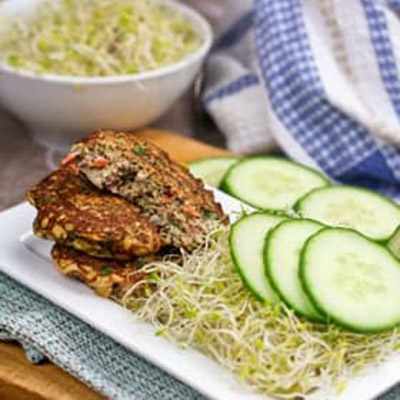 If you are looking so something a little different, these curry vegetable latkes might be just the thing. 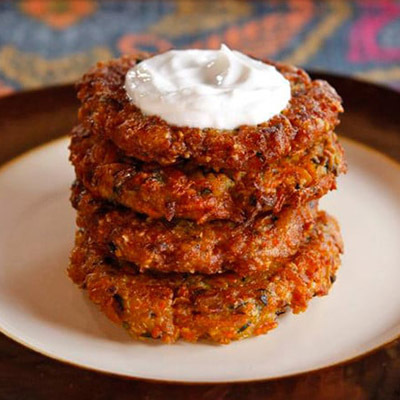 Zucchini, carrots and onion team up with spices to that these outstanding latkes. The recipe fries them in quite a bit of oil but commenters say that’s unnecessary. The recipe serves 18 and each serving has only 10 grams of carbs. Get the recipe here. 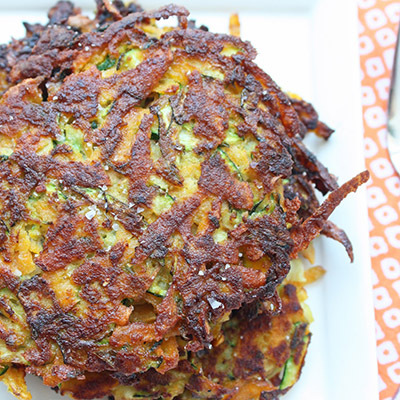 The creator of this recipe calls them fritters instead of latkes. We feel that one you put a shredded vegetable, meal and an egg together and fry it, you have made a latke. Whatever you want to call it, this recipe — with sunflower seeds, hazelnuts and lime juice — sounds amazing. With only 103 calories a serving and seven grams of carbs, this is sure to be a hit. Get the recipe here. 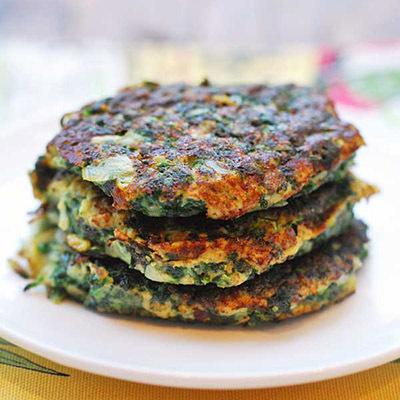 If you have a fondness for spinach and parmesan, this is the latke for you! With simple prep and fast cooking, you can whip up a batch of these with your guests in the kitchen. With 242 calories and 11 grams of carbohydrates, these are sure to be a hit. Get the recipe. Last, but certainly not least, what could possibly up sweet potatoes appeal this time of year? Zucchini. The combination is always a winner. The recipe says to fry with ghee but we prefer to use cold pressed canola oil because of ghee’s high cholesterol. With 122 calories and less than seven grams of carbs, we think these are a winner. Get the recipe. Which of these recipes sounds best to you? Maybe your family wants to try them all! No matter what’s on your table, or how you observe the holiday, we wish you a very happy Hanukkah!